0N S E P T E M B E R 11 , before much of the world was even aware of what had happened in New York, Washington, and Pennsylvania, the Bush administration had raised the country's nuclear alert codes from defcon 6 to defcon 2 - the highest state of alert before the launch code is operable. 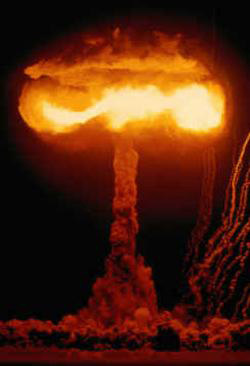 * Russia, the country with the second largest nuclear arsenal in the world, almost certainly responded in kind. As a result, thousands of nuclear weapons stood poised on hair-trigger alert, ready to be launched by the president of either country with a decision time of just three minutes. The intercontinental nuclear-armed ballistic missiles controlled by these codes have a thirty-minute transit time from Russia to America or vice versa. They cannot be recalled. And they pose an ever-present threat of global nuclear holocaust. The U.S. currently has 2000 intercontinental land-based hydrogen bombs, 3456 nuclear weapons on submarines roaming the seas 15 minutes from their targets, and 1750 nuclear weapons on intercontinental planes ready for delivery. Of these 7206 weapons, roughly 2500 remain on hair-trigger alert ready to be launched at the press of a button. Russia has a similar number of strategic weapons, with approximately 2000 on hair-trigger alert. In total there is now enough explosive power in the combined nuclear arsenals of the world to 'overkill' every person on earth 32 times.